Items are currently available only in the United States. International sales of the english language version are coming soon. During checkout please enter who you would like your autographed copy of "Biker Billy's Freeway-A-Fire" made out to. 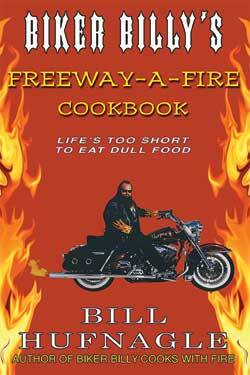 Biker Billy’s Freeway-a-Fire had been out of print for some time. I am pleased to announce that after a lot of hard work it is available again in a new Paperback First Edition. The book has been revised; it has a new cover and is printed in America on acid free cream-colored paper. The new edition is an attractive book that is filled with many great recipes that have been unavailable in print for too long. The Paperback First Edition was printed in limited quantities and is sure to sellout fast. These books can be autographed and personalized. They will make great gifts for fans of Biker Billy and fiery food. 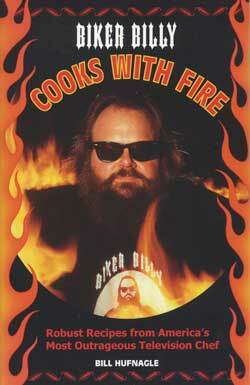 During checkout please enter who you would like your autographed copy of "Biker Billy Cooks with Fire" made out to. In his first book, Billy invites you to climb aboard for a culinary road trip as he gets the lead out with a sizzling collection of recipes for every meal of the day. These quick, full-flavored recipes are loaded with "fire" (a code word for some of the hottest peppers available), but Biker Billy's cuisne is not about torturing the tongue -- instead he creates snappy, memorable dishes, such as Lucifer's Angel Pasta, Spanokopita Diablo, Stuffed Shells from Hell, Blender Blaster Pie, and others that provide a real adventure for the taste buds. Rounding out this unique cookbook is a liberal sprinkling of biker banter, motorcycle tips, and ultra photographs that bring the joy and gusto of the open road into yoiur kitchen. "Biker Billy Hog Wild on a Harley" made out to. Harley-Davidson riders are a close-knit community that loves good food. The official motto of Harley riders may be “Live to Ride, Ride to Live,” but the unofficial motto is “Eat to Ride, Ride to Eat.” To help celebrate the 100th anniversary of Harley-Davidson in 2003, Bill Hufnagle, aka Biker Billy, collected 200 righteous recipes from HOG (Harley Owners Group) members and other Harley enthusiasts from sea to shining sea whose close-second passion is a fantastic, stick-to-your-ribs meal with no holds barred. There are plenty of Billy’s own favorites included, too. Here and only here are recipes for Nana’s Famous Horseradish Cheese Spread, Grandpa’s Oil Can Stew, Penne with Crankcase Vodka Sauce, Black Leather Tostadas, and John’s Prison Break Cake. 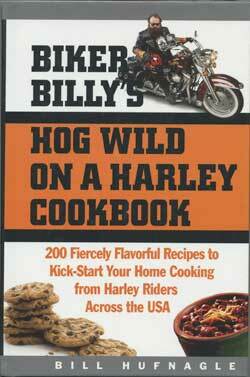 This is torqued-up-tasty food from a bunch of adventure-loving riders that’s certain to appeal to the millions of Harley riders across the U.S.A.
"Biker Billy Hog Roadhouse Cookbook" made out to. In Biker Billy’s Roadhouse Cookbook, America’s Biker Chef takes us on an unprecedented tour de force of roadhouse recipes, history, and memorabilia. Journey along with Biker Billy as he explores more than a dozen famous historic and scenic highways and byways―including Route 66, the Blue Ridge Parkway, Natchez Trace, and the San Juan Skyway―and the great eateries and recipes that line them. Discover topnotch but little-known eateries cherished by local riders. From blue-plate specials to grits, from key lime pie to a Colorado red chili fiery enough to carry you a thousand miles, Biker Billy dishes up more than 100 recipes to write home about. Seasoned road warriors, sofa adventurers, and food aficionados will find the full flavor and feel of America’s tastiest roadside cuisine in Biker Billy’s Roadhouse Cookbook. 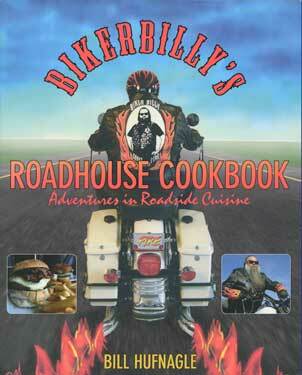 Garnished with history, tall tales, pictures, and maps, scrumptiously woven together as only Biker Billy can do.